Deutsche Reichsbahn BR 03, Nr. 03.154, Schnellzuglokomotive mit Vollumlaufschürzen und parabolischer Rauchkammertür. Geschwindigkeitsmesslok der LVA Grunewald, Borsig, Berlin-Hennigsdorf, Fab.Nr. 14474, Baujahr 1934, Tender 2`2`T32, Bauzustand 1934. Farbgebung: Schwarz/rot, Bw LVA Grunewald, Rbd Berlin. Deutsche Reichsbahn class BR 03, No. 03.154, express-train locomotive with parabolic smoke box door and streamlined engine. The locomotive was used by the LVA Grunewald for high speed research. Built by Borsig, Berlin-Hennigsdorf, Fab.No. 14474, in 1934. The locomotive is coupled with a tender 2`2`T32. Model shows condition of 1934, colouring: Black/red, depot LVA Grunewald, Rbd Berlin. 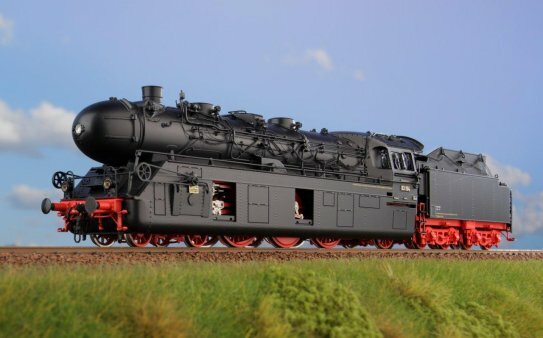 All special editions are sold only through us and they are not available in model railroad stores. For details, please contact us: microfeinmechanik@hotmail.com. We ship worldwide!